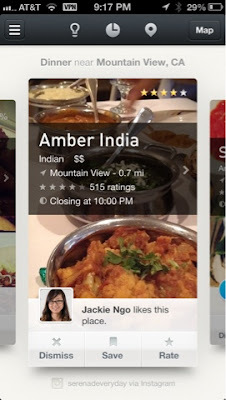 ForTechiesOnly: Ness 2.0 for iOS is Yelp Meets Google Now ! Ness 2.0 for iOS is Yelp Meets Google Now ! Yesterday Ness updated its iOS app to version 2.0 . Its awesome go get it ! But its also interesting to look at it from an app and UX design perspective. It is more of a total redesign then an update in my opinion , but having said that it is one of the best app updates i've ever seen on iOS. 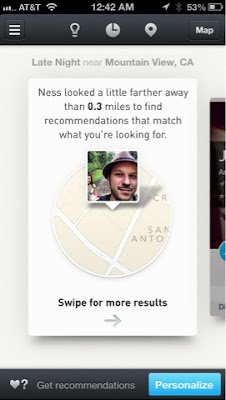 Ness (as in Likeness) is a prediction engine that ranks the probability of you likings restaurant or eatery . 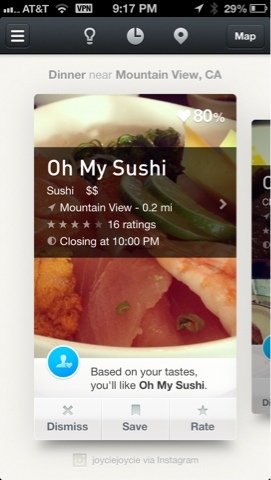 It uses machine learning fed with its own ratings graph, facebook checkins, foursquare checkins, and the checkins of all your friends. 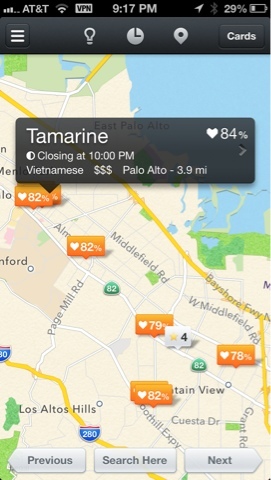 Based on this it calculates a personalized like score for every restaurant. 3. 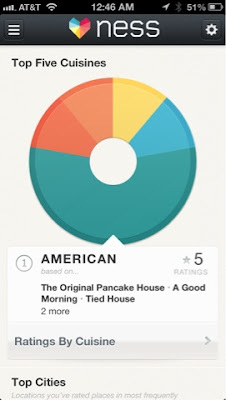 Ranks them according to its Personalized Like score just for you. The results are phenomenal. AND THEY FEEL PERSONAL TO ME. Yelp on the other hand asks me to type in a search, or use a menu navigation with a few clicks before it knows what i want right now. Furhtermore Ness has a lot of other interesting design implementation. The whole app is well designed end to end, and thought through from the eyes of a real user wanting to get a great restaurant recommendation for right now ! 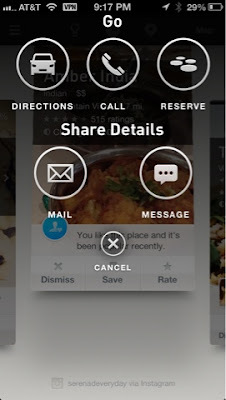 The whole app user interaction paradigm is reminiscent of Palm's WebOs "Cards". You can swipe left and right through a carousel of "cards" , with a restaurant featured in each card. You can also swipe up to get a shortcuts to "Directions" or "Calling" that restaurant. Lastly you can swipe a card down to save it as a favorite. The app continually keeps learning your "taste" graph from all of the swipes, saves, and other interactions. One other great feature is that all of the cards are constructed with pictures mined from Instagram Meaning , each card has beautiful photography that makes each place look as delicious as real life. And there is no need to manually design each restaurant in its system!! Go check our the app for your self . I am sure you will like it !